Welcome December! It is winter’s month of celebration that signals festive music, scintillating lights and the aroma of cinnamon and chocolate. Amid long-awaited family gatherings, last minutes shopping, eggnog and steamed pudding, there is a gentle call to find a quiet time of reflection. December signals an ending of a year and awaits, with anticipation and hope, the coming of a fresh beginning. Closure and expectation come together to ignite our holidays. This month ChasingART looks back at the artists who portrayed the Annunciation, the narrative of the angel Gabriel’s message of good tidings to Mary, who would conceive a child to be born the son of God. The Annunciation is the most frequent scene of Christian art, harkening back centuries. The message is recorded on canvas by artists who recognized the profound significance of the message that held both a closure and expectation. 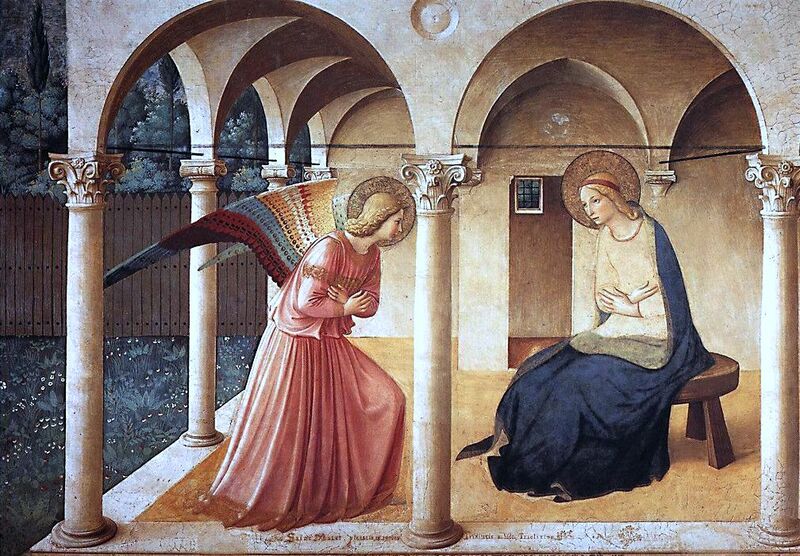 The Annunciation by Fra Angelico resides on the walls of the Convent of San Marco in Florence, Italy. When Cosimo di Giovanni de’ Medici aka “the elder” rebuilt the convent, he commissioned Fra Angelico between 1436 – 1445 to decorate the walls with elaborate frescoes. Little did Fra Angelico know that his fresco depicting Gabriel and Mary would forever place him in the realm of famous artists – that his name would be remembered over 500 years after his passing. In an age when the Renaissance was moving the world in the direction of humanism, Fra Angelico carried a firm reverence for his faith, which is evident in the joyful colours of Gabriel’s wings and Mary’s hesitant hand-position placed close to her body. The scene radiates amazement even as it records, in Mary’s eager face, an acceptance of destiny. What many may not know was that Fra Angelico had a brother, Fra Benedetto, who worked alongside him in the creation of The Annunciation. Years earlier in 1407, the brothers entered the Dominican Order of Preachers and lived in the Dominican’s monastery in Fiesole. Together, the brothers illuminated manuscripts. (Fra Benedetto went on to illuminate the choral books of San Marco). It has been said that they remained artistic partners for their entire lives. As we gather with family and friends in the weeks ahead, may we remember two brothers working together to capture a moment of profound transformation. It was a work of love and compassion that continues to inspire us today. “To have time to pause…to listen..to expect nothing. Words of poetry. And out of nothing comes something remarkable and life-giving – to satisfy the highest longing for life. I was looking into the history of Silent Night, written by Father Joseph Mohr, a young priest in 1816, which was first performed on Christmas Eve 1818 at St Nicholas parish church in Oberndorf, a village in the Austrian Empire on the Salzach river. I believe that creativity, whether art, poetry, song, or dance comes from a place of silence. Thank you for your friendship over the years. All the very very best to you and your wonderful family! Zeit zu haben, um zu pausieren … zuzuhören … nichts zu erwarten. Worte der Poesie. Und aus dem Nichts entsteht etwas Merkwürdiges und Leben spendendes – um die höchste Sehnsucht nach Leben zu stillen. Ich habe mir die Geschichte der Stille Nacht angesehen, geschrieben von Pater Joseph Mohr, einem jungen Priester im Jahre 1816, der am Heiligabend 1818 in der Pfarrkirche St. Nikolaus in Oberndorf, einem Dorf im österreichischen Reich an der Salzach, uraufgeführt wurde. Ich glaube, dass Kreativität, ob Kunst, Poesie, Gesang oder Tanz, aus einem Ort der Stille kommt. Vielen Dank für Ihre Freundschaft über die Jahre. Alles Gute für Sie und Ihre wunderbare Familie! So lovely to see this post from you! Sacred greetings and holy silences, closure and new beginnings are ours whenever we meet and part as friends and family. Have a beauty filled festive season, Rebecca. Thank you, Mary Jo, for your lovely benediction to this post. I agree wholeheartedly – friendships span great distances and yet feel as close as if in the next room. I love this painting – there is a feeling of joy and reverence. When I was doing a mini-research on Fra Angelico, I found this quote from Vasari’s “Lives of the Artists” on Fra Angelico – “it is impossible to bestow too much praise on this holy father, who was so humble and modest in all that he did and said and whose pictures were painted with such facility and piety.” Many hugs coming your way. Dearest, Valerie, our friendship has been a source of strength for me over the years – it has been nearly seven years. My first introduction to Fra Angelico was when my son, who was around 8 at the time, and I were viewing a book on “artwork through the ages.” The Annunciation by Fra Angelico captured our imagination. An angel with colourful wings, a garden setting, and a feeling that we were there, with Gabriel and Mary, listening to the conversation. Did you know (I didn’t) that Pope John Paul II proclaimed Fra Angelico’s beatification? He is now known as Beats Angelico. Hugs coming your way. I love your theme for December, and story you reveal about Fra Angelico and his brother is fascinating. Working closely with, or living alongside, a sibling is something few of us,in Westernized countries, get to do these days. As I wrote this post, I imagined the brothers working together – probably in silence, each knowing intuitively what the other was doing and planning. Isn’t it marvelous to know the story behind artistic endeavours. The work in the Convent was completed over a period of a few years. (The Annunciation is only one of the frescoes.) Together, in the heat of summers and and chill of winters, breaking bread together, talking about colours, how to instill a sense of reverence in the fresco. I love looking back and imagining. And I love looking back in your company. I am certain that Eadfrith did indeed work in silence. (I love it when you send me on another research project) The Lindisfarne Gospels are extraordinary – they could only be completed with a focused devotion. I am very interested in the link between Lindisfarne and Iona, St. Cuthbert & St. Columba. I am enjoying this research – so many stories that come to life with art. Art transcends time, space, location. It allows us to explore another time and way of thinking. Yesterday, I captured a photo of an enlarged archival photo (mural) of the same street taken in the early 1900’s. The mural was positioned on a new building, allowing a passerby to reflect on the progress that has been made over the course of a century. I wonder what the next century will think of ours. Oh I love him! He creates such delicate beauty. A perfect introduction to this beautiful season Rebecca. And I am thrilled to see a post by you in my reader and be the first to comment! I never knew that Fra Angelico had a brother – what an amazing duo! Thank you for the warm welcome to December. I have been away from my personal blogs but have been actively engaging within the blogging community. I have enjoyed following your marvelous posts that generate wonderful conversations.